December 8, 2008 by rwb, under Microcontroller. One of the frustrating part in learning AVR microcontroller for the beginners is the AVR microcontroller programmer. The question is how to program my AVR mircrocontroller; actually if you googling on the internet and search for AVR ISP Programmer there are plenty information; start from simply using your PC parallel port to the sophisticated Atmel owned AVRISP mkII programmer. This will rise another question; which one should I choose? Well, if you are looking for the Atmel AVR programmer you have to consider how many AVR devices does this programmer software support and how this programmer hardware will connect to your PC/Notebook, of course the best and the complete one will be the Atmel own AVR programmer. The well known open sources AVR ISP programmer is released by Atmel called AVR911: AVR Open-source Programmer (is that just a coincident they use the number 911, therefore you can see how important this topics is) and the hardware schema you could find on their application note AVR910: In-System Programming. The original schema use the old AT90S1200 and both the firmware (at90isp_ver23.asm) and the downloader (AVROSP.exe) only support a view old devices, fortunately there are peoples out there that keep this application note updated with the current devices. 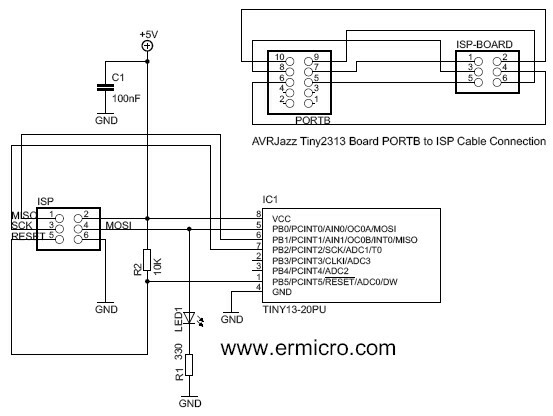 In this project I will use the AVRJazz Tiny2313 board from ermicro as the basic board for the programmer and AVR ATtiny13 microcontroller as the target for the programmer. The firmware is taken from Klaus Leidinger at mikrocontroller-projekte.de and I made some modification to the source code, so it can work with AVRJazz Tiny2313 board; this little changes is mainly on the ATTiny2313 microcontroller type (originally AT90S2313), crystal oscillator frequency (originally 7.3728 mHz), the LED’s routines (originally using dual color LED attached to the PORT B3 and B0) and the healcheck function to blink the board’s LED 5 times when it start. For the complete source code and the hex code you can download from here. Although the firmware can work very well with the Atmel’s AVRPROG that come with the AVR Studio 4 (from menu Tools -> Avr Prog…), but this programmer only support a view devices; beside Atmel look likes will not update this program anymore, the last time they update the AVRPROG (version 1.40) mainly just for supporting their new AVR Butterfly evaluation board which is using ATMega169. Therefore I choose AvrOspII from Mike Henning for the latest windows programmer version that supporting the AVR911 protocol; this programmer software support mostly used AVR microcontroller devices. 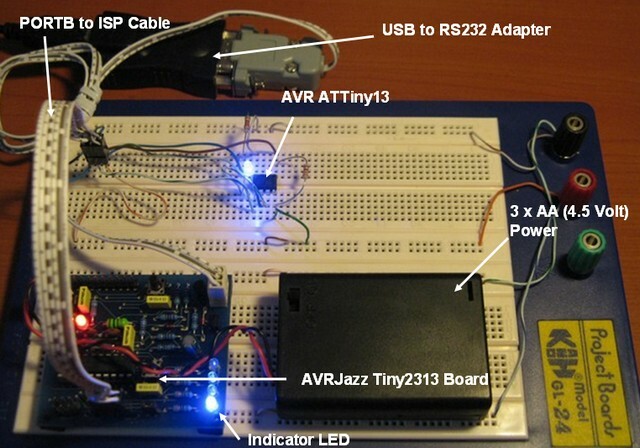 After compiling the sample code above on the AVR Studio 4 than start the AvrOspII program; if all connected then the programmer will automatically detect the target ATtiny13 microcontroller or you can click the Auto Detect button. Before you download the hex program check the Fuse Bits on the Fuse Bits tab, make sure you uncheck the Divide clock by 8 internally; [CKDIV8=0] and use the default Internal RC oscillator 9.6 Mhz, click the Program button to change the Fuse Bits and click the Read button again to make sure it’s already change. The Port is set to AUTO, baud rate is set to 115200 and the protocol is set to AVR911. Checked all the Auto Program setting (Erase, Verified and Exit) on the Program tab, load your hex file on the Flash fill in box and click the Auto button to start download the hex file into the target AVR ATtiny13. I have been using ladyada’s usbtiny programmer after building it myself and is quite satisfied with it. Recently I came upon this blog and tried to build it. Unfortunately the AVR OSP II says “supported programmer not found on com port 1”. I have checked both the atTiny circuit and the RS232 conversion circuit as given in this blog with other programs – they are running ok. It would be helpful if you may suggest a solution as I do not like to scrap a project because it is not working. Also has somebody else built this project? If so, I would like their feedback. 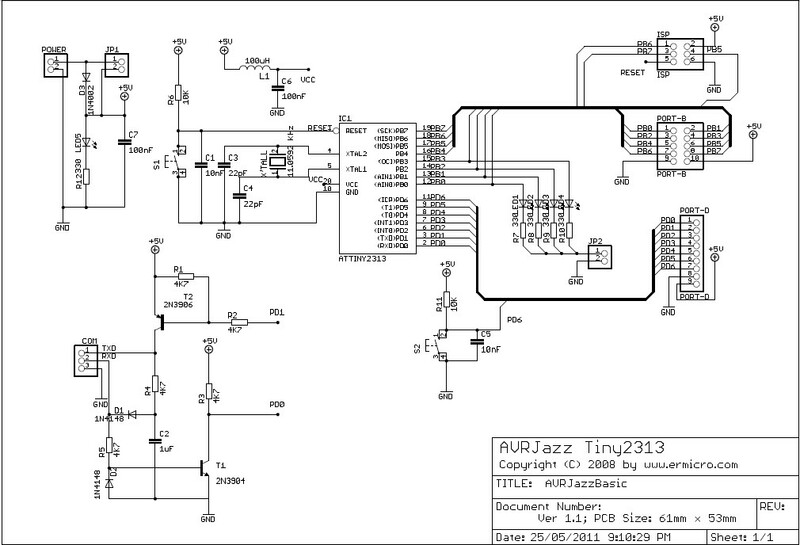 Remember the modified version of the original firmware is intended for the AVRJazz Tiny2313 board which come with 11.0592 MHz crystal as shown on the schematic above!